Phonix used their experience building the Brandedburg to build the Phönix D.I. The Phönix D.I was a great improvement over the Brandenburg, in fact a German Idflieg report stated “it possesses totally amazing qualities, especially the quickness of maneuver and stability when throttled down. The pilot can stall the aircraft virtually on the spot and drop several hundred meters without losing control.”This Aircraft was very stable and many two seater pilots made the transition into the D.I without incidence. 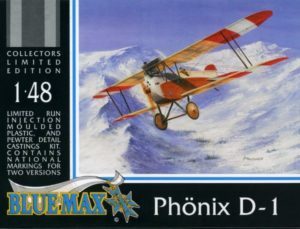 After flying the Hansa-Brandenburg D.I pilots favored the Phönix D.I. However not all was of good report. Flik 60/J reported that the Phönix D.I was not favored, as it was said to be slower than the SPAD and could not maneuver with the Nieuport or the Sopwith fighters. 120 Phönix D.Is were produced between September 1917 and March 1918 of these, 72 were still operational on 1August 1918. It was a very well rounded aircraft with no hidden vices and these numbers speak well of its qualities.